Rusted out car frames, flea-ridden fixed mattresses, shotgun shells, domestic violence, broken glass and the steady pop-pop-pop of small arms fire – ahhh, Nevada. 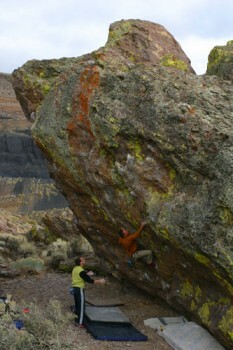 If you make it past the casinos in downtown Carson City with enough money left to buy chalk, then you’re probably ok, and you’ll love the bouldering. There isn’t a speck of granite worth pulling on for ten miles in any direction, which is great. After too many days in the basin, it feels good to grab some pocketed volcanic stone instead of cerebral Sierra granite. Goni rewards power and a high pain threshold - the pockets and edges here are really sharp, so taping ahead of time might give you a shot at climbing here two days in a row, but no guarantees. The backdrop of a massive, black cinder mine completes the surreal, industrial vibe and makes the Goni experience a cultural event as well as a good pump – a chance to observe the American Redneck in his native habitat. Which SuperTopo guidebooks cover Washoe Boulders?